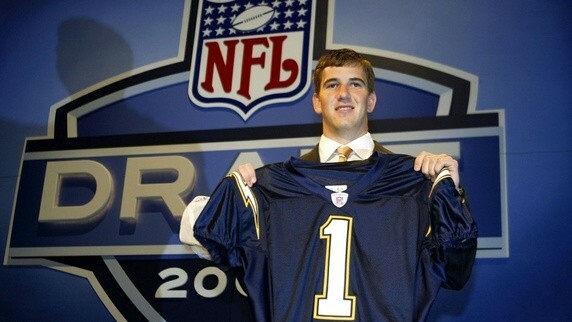 Although the Chargers were tied with three other teams for the worst record of the 2003 NFL season, the league’s tie-breaking system gave San Diego the number one pick in the 2004 NFL Draft. With this pick, the Chargers selected quarterback Eli Manning from the University of Mississippi despite Manning’s stated desire to play elsewhere. New York Giants general manager Ernie Accorsi, who had been in trade negotiations for several weeks before the draft with the Chargers, selected quarterback Philip Rivers fourth and traded him along with additional draft picks to the Chargers.